I’ve made every effort to make this site and my materials useful, informative, and easy to understand and use. 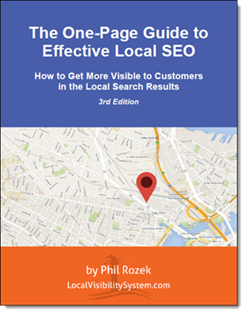 Local search is fun to learn about, but it’s constantly evolving, and I’ve never had any illusions that I know everything there is to know about it: I’m still learning, and always will be. Therefore, please don’t apply any of my suggestions without concluding through your own judgment that these are suitable for your business. Just so you know what I’m responsible for versus what I’m not, please take a moment to read the following Terms & Conditions. By using this site you automatically agree to them. If you don’t agree with them, please don’t use the site or my materials. By using this website, you agree to comply with and be bound by the following terms and conditions that govern your relationship to and use of this website, LocalVisibilitySystem.com. The term “I” or refers to the owner of this website, Philip Rozek. The term “you” refers to the user or viewer of this website. Any information or materials found on this website are used entirely at your own discretion and risk. It is your responsibility to ensure that any products, services or information available through this website meet your specific requirements. Neither I, nor any third parties, provide any warranty or guarantee as to the accuracy, timeliness, performance, completeness or suitability of the information and materials found or offered on this website. You acknowledge that such information and materials may contain inaccuracies or errors and I expressly exclude liability for any such inaccuracies or errors to the fullest extent permitted by law. My website or materials may contain links to other websites or resources of interest. However, once you have used these links to leave my site, you should note that I do not have any control over that other website. Therefore, I cannot be responsible for the protection and privacy of any information that you provide while visiting such sites, and such sites are not governed by these Terms and Conditions of Use. I will not be liable for any loss or damage including without limitation, indirect or consequential loss or damage, or any loss or damage whatsoever arising from loss of data or profits arising out of, or in connection with, the use of this website or any materials contained in or referenced by it. I will not sell, distribute or lease your personal information to any third parties unless I have your written permission or am required by law to do so. Your use of this website and/or registration for my private email list implies your familiarity with and acceptance of these Terms. I am committed to ensuring that your privacy is protected. Should I ask you to provide certain information by which you can be identified when using this website, you can be assured that it will remain secure. In order to prevent any unauthorized access or disclosure, I have put in place suitable physical, electronic and managerial procedures to safeguard and secure the information that I collect online. I may collect the following information about you: name and job title; contact information including email address; other demographic information such as postcode, preferences and interests; and any other information relevant to customer surveys and/or offers. This information is required to understand your needs and provide you with a better service, and in particular, for the following reasons: internal record keeping; to improve my products and services; to send you periodically promotional e-mails about new services or products, special offers or other information that I think you may find interesting by using the email address that you have provided. I also use third-party web analytics services to monitor users’ browsing behavior. I do this only to find out which areas of my website are performing well and which areas need improvement. This website contains material that is owned by, or licensed to me. This material includes, but is not limited to, the design, layout, look, appearance and graphics. Any reproduction of these materials is prohibited, except when permission is expressly granted by me upon request of the person(s) who wish to reproduce or circulate my materials. Unauthorized use of this website or any of the materials therein may give rise to a claim for damages and/or be a criminal offence. Every effort is made to keep this website up and running smoothly. However, I take no responsibility for, and will not be liable for, any temporary unavailability of this website due to technical issues beyond my control. Any dispute arising out of the use of this website is subject to the laws of the United States of America. I may change this policy from time to time by updating this page. Check this page from time to time if you want to ensure that you are happy with any changes. This policy is effective from May 29, 2011.